My girls' school had a Science Fair recently. One of its goals was to get parents involved, and because their Daddy's a scientist, he was all over this! :) He gave the girls each some ideas and they chose which one they wanted to do for their projects. 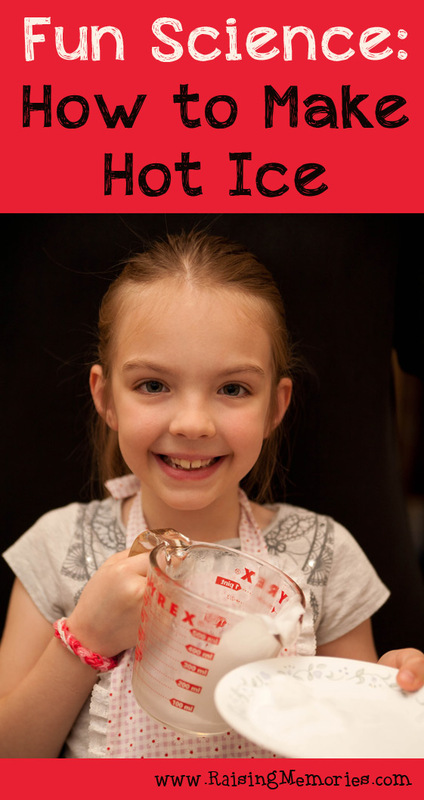 Talia's was making "Hot Ice" (from Sodium Acetate). Below, I'll be sharing instructions to make your own, followed by some tips & tricks to help you if you're giving it a try! a. IF YOU ADD VINEGAR TOO QUICKLY IT WILL OVERFLOW!!!!! b. This is now sodium acetate and water. We need to get rid of most of the water. a. 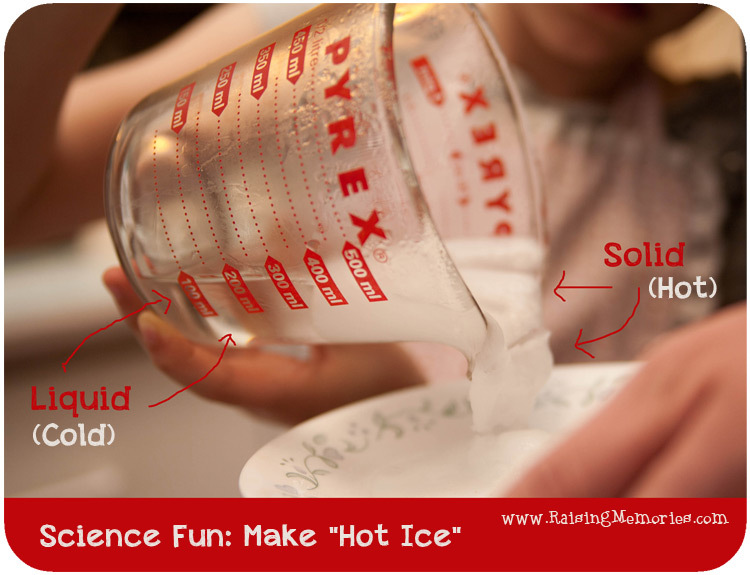 When the right amount of water has evaporated, a film will start form on the top of the liquid (the liquid is sodium acetate trihydrate – 3 water molecules for each sodium acetate molecule – which is what we want for our hot ice). The film is easier seen when not stirring. b. Add a little bit of water (1 tablespoon at a time) until the film disappears. 4. Put 1 tablespoon of water in a glass container (that has a lid) and pour the liquid from the pot into the container. a. Be careful not to get any crystals into the solution and not to splash on the sides or rim of the container. a. Save the little crystals that form on the side of the pot – they will be used to start the crystallization process. The crystals are sodium acetate anhydrous (no water molecules). c. Put a crystal on your finger and touch the liquid making it seem like YOU are turning it to ice. 1. 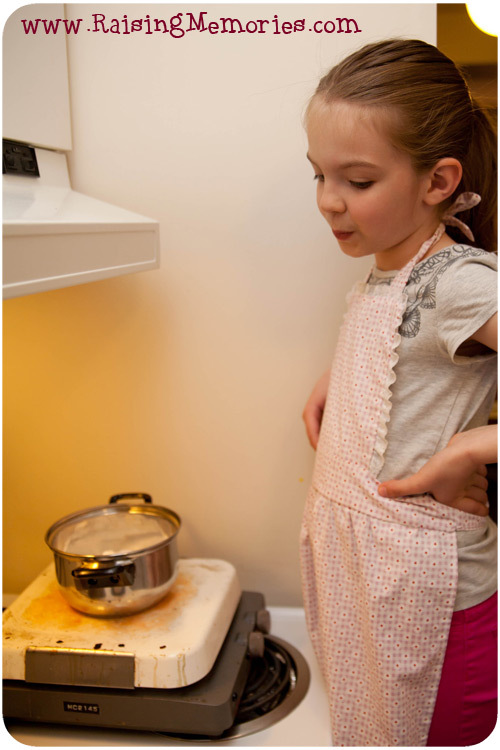 Making sodium acetate this way WILL make your house smell like vinegar. 5. If any crystals were added to the glass container before putting in the fridge, the solution will crystalize. Simply re-melt the crystals and try again – perhaps putting in a new clean container. Often crystals will form on the lid, so be careful when removing lid. 6. The crystallization gives off heat – but only around 42 degrees Celsius, not enough to burn, so it is safe to touch. 7. Sodium acetate is non toxic, but can sting your eyes and will make your hands smell strongly of vinegar so make sure to wash your hands well after touching.